Info "Oh, no! You’ve turned into a spring! Whatever you do, don’t get hit!" Spring Training is one of Dribble and Spitz's Microgames in WarioWare: Smooth Moves. It shares its theme with Rally and Cry. 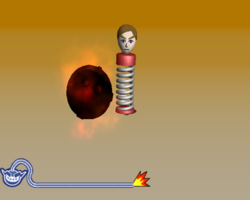 The player has to move his or her Mii's head attached to a spring to avoid the fireball projectiles coming at it. Occasionally, spiked balls appear instead fireballs. 1st level difficulty: One fireball is shot. 2nd level difficulty: Two fireballs are shot. 3rd level difficulty: Three fireballs are shot. This page was last edited on February 20, 2018, at 15:43.